December 31, 2015: More than 40 years ago, I took a self-portrait of me holding a poem at this desk which was my brother's when he entered Texas A&M in 1956. The poem from 40+ years ago was about a poet. I give you today's poem to close out this year of Still...life. 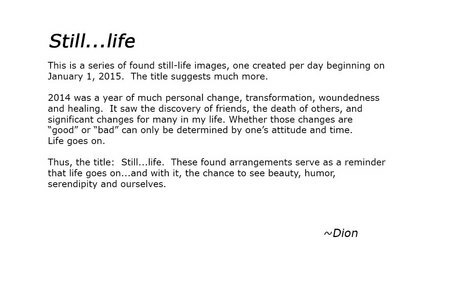 Still...life 12/31/2015 The year ends / A string of moments / Assembling themselves as memories / Of trials and tribulations / Victories and successes / Healing and health / Sickness and sadness / Birth and death. / In moments of stillness / Life is seen / Heard, felt, sensed / The images filed to memory. / Leap out, take flight / Face the challenges / Ride with the joys / Love constantly / Never forgetting / There is / Still / Life. 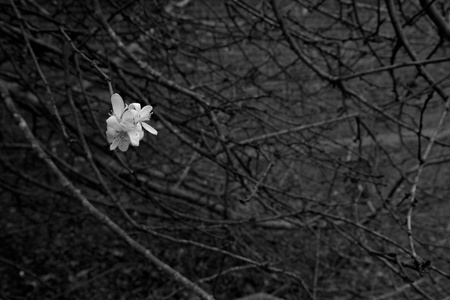 December 30, 2015: The bare branches reveal that it is supposed to be winter; the new bloom reminds us that, despite all appearances, there is...Still...life. 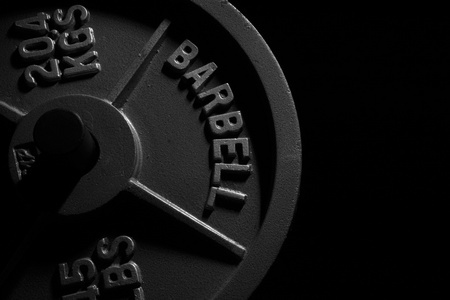 December 29, 2015: These weights have been safe behind clutter in the garage. I recently freed them by moving the inhibitors to a storage unit. They beckon, a few days before New Years, for my attention which I have tried to give them slowly. I'm not as young as I used to be, after all. But alive. Still...life. December 28, 2015: Years ago, while teaching photography in Czech Republic, I encountered a man in Praque who was resting with his dog. Through a combination of languages (English, Czech and German) and a dictionary, we were able to determine that he wanted some photos of him and his dog. I sent him some prints and to this day I receive random packages from him. Today, I received this set of cards, an ornament (I love angels), and a cookie. Note that the dog "signed" the card, too. Life is about connecting to people. Still...life. December 27, 2015: Another late night, pondering. I look at his shoes, this young, bearded man who a few blinks ago had feet that I put in my mouth just to see his smile beam. I look at his shoes, knowing already that those who follow him in work or lineage will, indeed, have big shoes to fill. The same is true for his two brothers. A dad's pride and my heroes...my sons. Still...life. December 26, 2015: Unusually warm for the day after Christmas, even by Houston standards. The conditions are right to pause and collect the moment of serenity and peace, and to think. Or not. Just be. Just...be. Still...life. 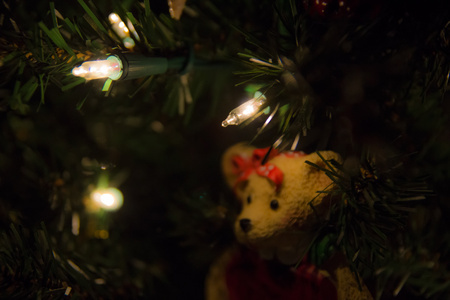 December 25, 2015: Christmas day, not so much one about presents but about gifts and prayers. Still...life. December 24, 2015: Pausing on the way to Midnight Mass. It is good to remember the real meaning of things. Still...life. December 23, 2015: Leaving the office and privileged to have the colors strewn in front of me. For a black-and-white photography guy, colors rock. Still...life. December 22, 2015: I wonder if in his earlier years he held this position to watch as little children ran excitedly to the tree. 'Tis the season. Still...life. 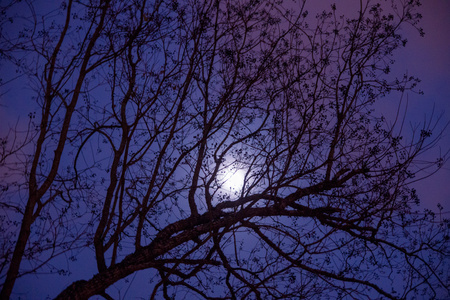 December 21, 2015: As the moon arises, new colors emerge. We live in a world of amazing colors, in more ways than one. Still...life. December 20, 2015: Closing in on midnight, with the stall door open to put away the kayak that my youngest and I used to get to one of his favorite wading spots for night fishing fun. I never tire of "playing" with my boys. (His 6.75 pound speckled trout was a sight to behold; my trout and redfish were fun to hold.) Still...life. December 19., 2015: This sculpture in a nearby park commemorates a beautiful moment, far from the reality of kids texting each other only four feet apart. We've lost too many connections. Still...life. 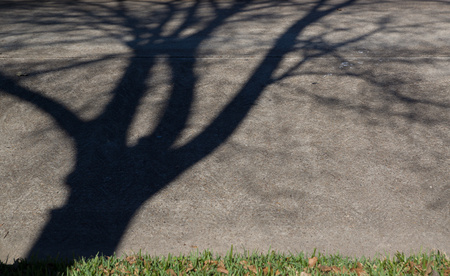 December 18, 2015: A shadow tree grows from my yard and into the street. moving around as the sun moves. Shadow leaves are much easier to rake, I bet. Still...life. December 17, 2015: It's a plane, it's a meteor, it's Superman...or just a lowly street light doing its job day after day. Even the most mundane work done well matters. Still...life. December 16, 2015: Taking the camera out of the car so I could get a "Still...life" image, wondering what it could be at this time. I looked up. Question answered. Still...life. 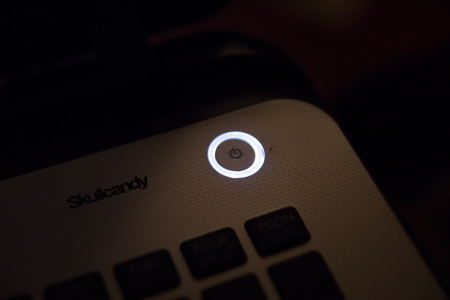 December 15, 2015: Working late, wishing I had a power button, too, in order to reboot and keep going. Still...life. December 14, 2015: Water drops on the window, shadows waltzing slowing in their space and the textures of the threads...a morning wake up call to see every thing. Still...life. December 13, 2015: Simple, serene and calming on this day of rest. Still...life. December 12, 2015: Found vibrance on an otherwise cloudy day. Still...life. December 11, 2015: Before there were "50 shades of gray," there was the Zone System in photography. The latter is more enduring and satisfying. Still...life. 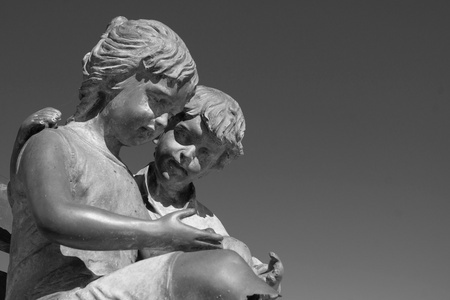 December 10, 2015: This statue in Texas City captures one of the most meaningful, joy-filled moments in a dad's day. Still...life. 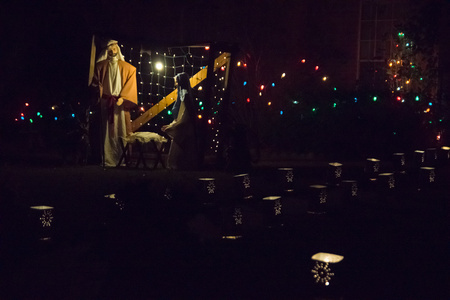 December 9, 2015: Yes, I admit that I participated in a drive-by shooting...of this beautiful scene and alignment. Still...life. December 8, 2015: The art of simplicity. Still...life. December 7, 2015: Courage. Bear it every day. Still...life. December 6, 2015: I was out for a few days (so the past few days images were not created on specified day, but close) at an ACTS Men's Retreat. Faith influences what I see, how I write and how I think. Still...life. December 5, 2015: One of my favorite forms of grapes. Still...life. December 4, 2015: The simplicity of colors and textures, the red brick standing out from the blue-ish light. Even subtle colors are amazing. Still...life. December 3, 2015: A found still life. Seek and you shall find. Still...life. December 2, 2015: A beautiful sky is enough to take one's mind off the frustrations of strings of awaiting brake lights...traffic. Still...life. December 1, 2015: Heading home, just before midnight. Cold air, light mist creating drop patterns on my rear window that are drawn out by lights. Every moment a chance for an image. Still...life. November 30, 2015: Painting my dad's old reel with light honors it without changing it like a fix-it job would. Instead of restoring the reel, the image restores memories. A lot of good times were had when this was held in my dad's hands. Still...life. November 29, 2015: Dark shadows, a place to see things as something they aren't. Darkness has a way of revealing, at times. Still...life. November 28, 2015: The season begins. Pause. Think. Still...life. November 27, 2015: Advent arrives soon. This will be a particularly meaningful Christmas season; I can tell already. Still...life. November 26, 2015: Morning light; coffee; another day alive...much to be thankful for on this Thanksgiving day. Every day should have a bit of thanksgiving in it. Still...life. November 25, 2015: A bit brain dead today. Staring at the ceiling with a brain full of brain things. A pause to appreciate light, shadow and texture...a photographer's tool chest. Still...life. November 23, 2015: Almost every day this chair catches my eye for its colors, textures, worn qualities... Don't ignore intriguing things. Still...life. November 23, 2015: From the darkness, the simple reminder in this corner of my screen as I work late at night...I've been a writer since 12. Writer and photographer...more than "interests," they are my DNA. Still...life. November 22, 2015: Not quite the reds and greens of the holiday season, but the colors, rawness and lighting provided another reason to stop and celebrate...with an image. Still...life. November 21, 2015: A chill in the air, a fire blazing. Mesmerizing, calming, re-assuring. Beautiful. Still...life. November 20, 2015: I never cease to enjoy views of her and for what she stands. Never surrender liberty and freedom. Still...life. November 19, 2015: Best class I ever took at UH 40 years ago was Dr. Lemke's pharmacy class for non-majors. I know what to use and when on days like these, of which there are many. Knowledge endures. Still...life. November 18, 2015: Depleted and almost asleep, I recalled that I hadn't created an image for the day yet. This painting with flashlight turned out to be simple and fun. Simple...and fun. Simplify, simplify.... Still...life. November 17, 2015: I look..and relax. Relaxing is a good thing. Still...life. November 16, 2015: Almost 50 years ago, dad etched his initials into these metal shears. They bring me comfort to see or to hold; three letters of connection spanning decades, father to son. Still...life. November 15, 2015: Look into narrow gaps to see what there is to see. Still...life. November 14, 2015: Into the abyss, from stairway to temptations. Still...life. November 13, 2015: The proverbial message of "When one door closes, another opens," does not take into account the possibility that more than one door is open for you. Still....life. November 12, 2015: Night and no moon, but city glow draws the clouds out of the night sky. A wonderful view from my driveway after teaching photography class. Still...life. November 11, 2015: A dozen years ago I photographed him spitting over the pier railing, bored with fishing. Today, he is accomplished and loving life associated with fishing. This image from a session for a kayaking magazine...my how they grow up. Still...life. November 10, 2015: Magic happens at little tables. Still...life. November 9, 2015: Years of moments can wear away the painted surfaces and work away the smooth edges. Still...life. November 8, 2015: Nothing extraordinary here. And then I noticed the heart. It works that way sometimes. Still...life. November 7, 2015: A paver brick from a donation made long ago sits in a garden to remind me art is everywhere, in everyone. Let it out. Still...life. November 6, 2015: Brilliant colors of red, orange and yellow atop green stems reflected in a mirror...let your imagination run wild. Remember your imagination? Still...life. November 5, 2015: "Meaningful happens here," indeed. I had the pleasure of touring Brookwood Community for adults with disabilities. An amazing place. "Meaningful happens here"...does that apply to where we are each moment of each day? Still...life. November 4, 2015: The egret spreads its wings outside my office. I left a cozy 27-year career to try to offer this experience of spreading one's wings. The calling continues. Still...life. November 3, 2015: It looks like Dracula got to my apple before I did. Perhaps just a flight of imagination. Still...life. November 2, 2015: A tip of the hat to Edward Weston. Still...life. November 1, 2015: Color, form and texture. Simple, yet inspiring. The simple usually is. Still...life. October 31, 2015: A day of heavy rain created curb-to-curb water across the street. In my youth, I would play in the gutters (as we called them) walking and splashing in the water. I did it today. Some things are too good to grow out of. Still...life. October 30, 2015: Is this "please knock and don't ring," or "please knock...and it will be granted unto you?" Don't be too quick to interpret messages. Still...life. October 29, 2015: Life springs from the shadows...and other wonderful places. Still...life. October 28, 2015: I created this thinking "black and white," but changed my mind when I looked at the image on the screen. There's no shame in changing one's mind about how best to share a thought or feeling with others. Still...life. October 27, 2015: The colors of lonely darkness can be beautiful. Late night has it owns set of colors and intrigue. Still...life. October 26, 2015: Even when things appear black and white... they aren't. Still...life. October 25, 2015: It seems like there should be a country and western song inspired by this scene. Life inspire. Still...life. October 24, 2015: Once again the weathermen predicted horrific rains. Maybe they fell somewhere, but not here. The front tile did get wet though when my son walked in. Fear and panic are not good guides for decisions. Still...life. October 23, 2015: Food distribution day for Galveston County Food Bank mobile food distribution. More people in line than I could imagine. Mothers bring their children, and volunteers reach out amidst the busy-ness of helping to feed the needy. Still...life. October 22, 2015: Late night and tired, looking for the image of the day. Color, shadow and form right in front of me beckons for attention...so I give it. Snap. Still...life. October 21, 2015: Guardians of the garden. Strangely different after the received their winter trim. Still...life. October 20, 2015: Shadows of coat hangers trace against the textured wall. Interesting things don't need to be complicated. Still...life. October 19, 2015: This will be the last time the lemons are part of this body of work. They are about ready, soon to become juice and zest. Months of growing paid forward to tasty eating. Still...life. October 18, 2015: The light lowers in the sky, giving a lovely view of colors, textures and beauty. On a major drive in a large subdivision. Pause, there's beauty. Still...life. October 17, 2015: Shadow play at the beginning of the day. 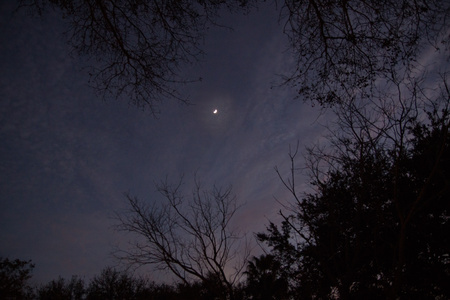 The dance of light and dark moving as the wind jostles the pecan tree sends me on my way. Still...life. October 16, 2015: The camera was inadvertently set to panoramic, a function that I've never used on this camera. Instead of the horizon, I photographed a circle of stones. Inadvertent conditions opens the door for experimentation and discovery. Still...life. 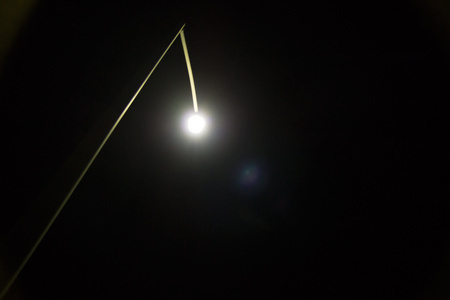 October 15, 2015: The utility light, with a dead bulb, harkens back to times of working at night on cars and other projects, by a utility light accompanied by flying insects. Still...life. October 14, 2015: I began school in this building on the 10th anniversary of the school's opening. Thanks to all who had the courage to start and sustain it. How far Strake Jesuit has come. I spoke at Career Day and felt familiar in the much changed campus that still holds strong memories. Still...life. October 13, 2015: The cues stand in the corner unused now, but reminding me of times with my dad, friends, neighbors and sons...anyone I knew, I played pool with it seems. Time to rack 'em up again. Still...life. October 12, 2015: Wabi-sabi is the concept of the beauty of decay and aging. I didn't put that much thought into this image, though the message holds true. Still...life. October 11, 2105: The beauty of colors, textures, forms...as close as a backyard. Still...life. October 10 2015: The graceful lines of a light array seen anew. No longer will it simply be the lights in the hallway. Still...life. October 9, 2015: Whether flapping in the breeze or emblazoned on a mug, the Texas flag always makes this Texas boy smile. Roots matter. Still...life. October 8, 2015: Keeping it simple with a splash of special. Such is life. Still...life. October 7, 2015: These lemons have appeared several times in this project over the year...beginning with the little blooms. It is about time now to harvest. With patience, harvest always comes in one way or another. Still...life. October 6, 2015: After the workshop, a woman came up and gave me this handcrafted note. It made my day. Make someone's day with a special thank you. Still...life. October 5, 2015: A sphere of flowers, or so it appears. No special effects, just special attention. No need to get fancy or "special" in living..just pay attention along the way. Still...life. October 4, 2015: In the morning light, this weed becomes a work of art. Nature's art. It is up to us to see in a different way; it was always art. Still...life. October 3, 2015: The morning fog moves across the water as the new day begins and temperatures change. My place away from places brings me calm and reminders of how beautiful the world is. Pause. Notice. Create. Still...life. October 2, 2015: In the morning light, even this recycled recycling bin and potato plant appear beautiful. Changing perspectives and seeing in new light works for more than potato plants, too. Still...life. October 1, 2015: This old Chris Craft, once a glory in her day, now sits full of stories and largely overlooked. I'd love to hear the stories. Still...life. September 30, 2015: Evening light on gentle curves revealing form and texture. Sounds like a review of a fine art portrait....such works for trees as well as people. Still...life. September 29, 2015: We often look for a switch to turn things off, turn them on, make them appear, make them disappear...that doesn't work in life. Still...life. September 28, 2015: Space Center Rotary Club honors their luncheon speakers with a book donated in their name to a local elementary school. This is the book they donated in my name. I could not be more proud. Still...life. September 27, 2015: We were all supposed to get excited about the rare occurrence of the Super Moon and the lunar eclipse. This isn't it. But the moment I took the photo of my outdoor light was the only time that moment would happen in my life. Still...life. September 26, 2015: A day's coffee in this cup--my warm, motivating, energizing friend follows me around thanks to this cup, a gift from my son. Still...life. September 25, 2015: Almost like a Zone System in blue, appropriately found at the Houston Center for Photography. Still...life. September 24, 2015: This dark shadow is of a shiny chrome-like light. How something so dark can come from something that appears so shiny. Yin and yang. Still...life. September 23, 2015: Sometimes things are just a bit off. Who wants to be perfect anyway? Still...life. September 22, 2015: Looking at the box, I could almost smell the developer and fixer, sense the dimly lit space of the darkroom....I travelled in time, for a moment. Still...life. September 21, 2015 Steps can take us places. Each set provide pause for thought...where can these steps take me when placed appropriately. Still...life. September 20, 2015: The sun winks through the trees, catching my eye and my heart. Still...life. September 19, 2015: The last phases of green before fall begins to set in at my place away from places. I cannot go here too often, says my soul. I believe it is right. Still...life. September 18, 2015: This empty flagpole has served me and several flags well. Time to put it back into commission. Still...life. September 17, 2015: Warm headlights, cool dusk light...a beautiful time to see colors. Still...life. September 16, 2015: The leaves thriving against the backdrop of cold stone, an interesting view to provoke thought...outside the Jung Center. Still...life. September 15, 2015: This chandelier strikes me as even more beautiful when seen from below. Beauty is found in ways other than intended or expected. Still...life. September 14, 2015: The natural grace of nature's forms can remind us of graceful lives. Still...life. September 13, 2015: Stand straight in the light against the darkness. Still...life. 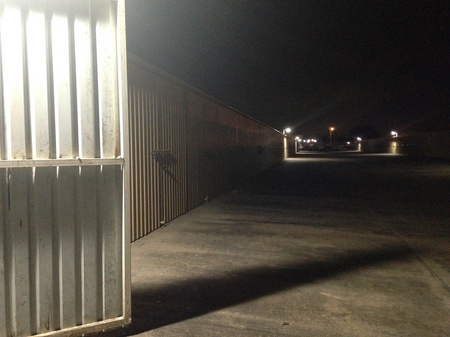 September 12, 2015: Read Thoreua's "Walking" essay, and then grab your boots for a nice saunter. Still...life. September 11, 2015: "Peel away the onion..." Nah. I think I will study it thusly and know not all the details...in the finding there are often tears. Still...life. September 10, 2015: If I were a knife blade, this is the one I would be. Not as sharp as I once was, still capable of getting the job done, visibly worn from dutiful service. No collector's item, this one. Still...life. September 9 2015: This cup survived a quarter century as a reminder to seize the day. The cup was a gift at the time of the movie Dead Poet Society. It broke while I was coaching two people on how to find and share their stories. Perfect! Still...life. September 8, 2015: More than a title of my book. More than the way I photograph people. More so, my take on life. The full title? "Show me who you see in me," which was what I truly was asked. Still...life. September 7, 2015: For a moment, just a moment, I was not numb to the routine of going to the mailbox to see how much junk is in the box. For a moment, I felt the hope of a child looking for a card or something. Then...I threw all the junk away. But...for a moment.... Still...life. September 6, 2015: The scents, scents and memories associated with bacon cooking on a Sunday morning never cease to give me a sense of peace and satisfaction. Still...life. September 5, 2015: Bold greetings await us often, but we see them as the familiar. Familiarity breeds...a blindness of sorts. Still...life. September 4, 2015: Sublime. It just made me smile, and that is always a good thing. Still...life. 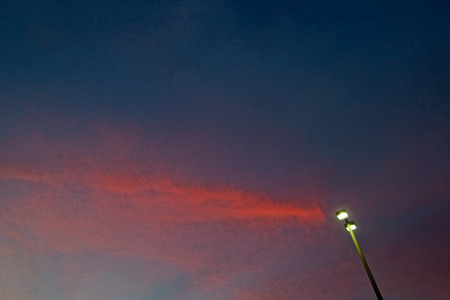 September 3, 2015: Walking through a parking lot to a building to teach a photography class...a great moment to see. Still...life. September 2, 2015: Simple pleasure from simple patterns. Still...life. September 1, 2015: Not to argue with the wisdom of an international organization, but I like "bring your gifts to the world" better. Yeah, do that. Still...life. 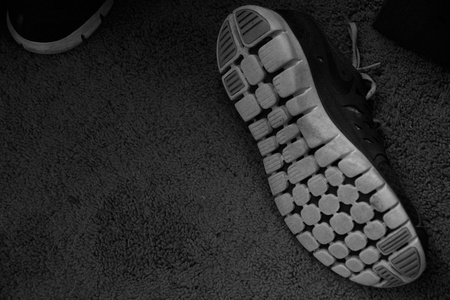 August 31, 2015: Forrest Gump said you can tell a lot about people by looking at their shoes. Hmmmm. Still...life. August 30, 2015: A beautiful sunset always seems to say, "it is a beautiful, blessed world. Did you enjoy the day and take it all in? You should have." Still...life. August 29, 2015: Sitting in a 65-degree room with barrels full of craft beer for my middle son's birthday fun. As fun as the get together was, it has been more fun to watch my sons, and now the grandgirls, grow. Still...life. August 28, 2015: Pallets fascinate me. Their labor is hard and then they are discarded unless some wise or handy person gets ahold of one to transform it to a new life of purpose. A lot of things work like that. Still...life. August 27, 2015: Old and weathered--once a shiny new, blue sign standing starkly against the red brick backdrop--she still serves her role and service. Duty before appearance. Still...life. August 26, 2015: There are days when we just need a place to plug in and recharge. Still...life. August 25, 2015: While I admired the beauty of the impending storm and related colors, I also worried about my son and his friend who had gone offshore fishing thanks to the great weather reports. While I photographed, he worked mightily to not be Gilligan's Island II. At any moment, people are not seeing the world the same way. Still...life. 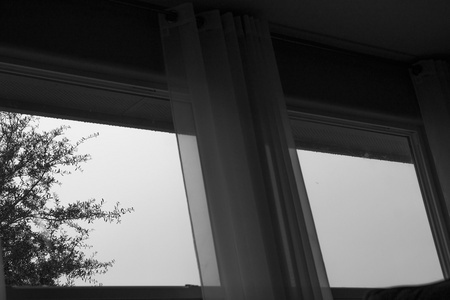 August 24, 2015: Again, lines, light and shadow attract me. I am a moth. I cannot stay away. Still...life. August 23, 2015: For more than a decade, I have parked facing this building when I teach photography classes. Sitting across from where classes happen, it inspires images and questions. I need to walk across that street. Still...life. August 22, 2015: In the summer stillness, it sits waiting for a breeze, waiting for the chance to live out what it was created for: soft, pleasing sounds. Everyone needs such breezes. Still...life. August 21, 2015: There is beauty and story in that which is worn and dinged, be they objects or people. Still...life. August 20. 2015: The calm and restorative qualities of rain, green and life. Still...life. August 19, 2015: The end of my first day 'back in the saddle" of work after a two-week road trip. I began wearing boots in 1994; little did I know how much they fit my spirit, whether I'm in a suit or overalls. Boots--where soul and sole meet the ground upon which I walk. Still...life. August 18, 2015: A coat hanger discarded in an ash tray provided everything I needed in the moment to see. Simple is good. Still....life. August 17, 2015: Heading home, crossing the Mississippi. I've always admired bridges...from a distance. Passing over is a passage...returning to home, or heading to my roots, depending whether heading West or East, respectively. This is also the river that took my friend Brian 40 years ago this summer. Still...life. August 16, 2015: It is in the subtle signs that we're reminded of others along the journey with us. Still...life. August 15, 2015: Mea culpa. Still...life. August 14, 2015: Reach for sensation, for something new, for the feeling of being alive. Still...life. August 13, 2015: Solitude. Good for the soul and spirit. Still...life. August 12, 2015: Rise above, see anew. Still...life. August 10, 2015: In times of joy and sorrow, peace and strife, our spirits are drawn to the edge...where land and water meet. Peace. Still...life. August 9, 2015: Many signals appear to remind us to climb..to grow...to seek new vistas and perspectives...to reach for higher. Still...life. August 8, 2015: I am in awe of settlers who saw raw land, raw resources and said "We can build something here." Respond to opportunity not to the sense of impossibility. Still...life. August 7, 2015: Looking out over a pier in a new place creates feelings of new adventure and old familiar sensations. Nature has a way of doing that. Still...life. August 6, 2015: Cemeteries everywhere speak silent stories: loss, waiting for reunion, loving...they are humbling, assuring, calming. Still...life. August 5, 2015: I believe God surrounds us, but that doesn't mean I don't also like to go into a centuries old church to get that feeling that "God lives and listens here." So it is at the Cathedral of St. John the Baptist in Savannah, GA. Go...and be heard. And listen. Still...life. August 4, 2015: A simple stone took my breath away this year though I saw it last year. This is great-granddad and great-grandmom. He a Civil War survivor; both survivors of different types. I felt the call of their spirit and DNA. I find great comfort finding more of my tap root, albeit found in stone. Still...life. August 3, 2015: The end of day one of a two-week road trip ended in Meridian, MS. A brief text to my sons advised them, and reminded me...I was there a year ago for a special, important trip. Book forthcoming. Still...life. August 2, 2015: Traffic to the left of me, traffic to the right of me, and I'm stuck in the middle...sounds like a song! Traffic: a time killer by torture, and motivation to "head out of town." Still....life. August 1, 2015: A surprise for the day. My son laughed as he followed me home, his car (that I was borrowing) blowing anti-freeze steam, and me calm as if going on a joy ride. It took a few stops to make it three miles, but the car can live another day. Midlife awareness for handling issues...a wonderful thing. Still...life. July 31, 2015: Simplicity and beauty of form...of lines...of found balance. Still...life. July 30, 2015: A busy day in the new life, my tired coat hung at the end of the day reveals some of the roles. Life is abundant. Still...life. July 29, 2015: The sun winks over the horizon; a smile breaks right below the line of sight. "It's going to be a good day on the water." Fish and memories were the catches of the day with my youngest. Many new firsts on this day. Still...life. July 28, 2015: Replace tubes? A chance to see and play in a doorway to the past brought back comforting waves of nostalgia. It can be good to reach out to hold the hands of younger days for its calming effect. Still...life. July 27, 2015: Star gazing in the garden. Still...life. July 26, 2015: Light and shadow never ceases to amaze me their abilities to reveal or hide...be it for ceilings or souls. Still...life. July 25, 2015: The spring deluges that were supposed to extend throughout the summer have resulted in four-tenths of an inch for July. Laying the hose down for the fig tree provided a view that reminded me of playing in sprinklers as a kid and as a dad. Torrid heat can be good for play. Still...life. July 24, 2015: There are times that life's directions should be so clear. Still...life. July 23, 2015: So often we focus on what may be locking us out instead of that which will let us in. Still...life. July 22, 2015: During the day, light brings us everything. At night, light carves meaning and vision out of darkness. I like the night. Still...life. July 21, 2015: Walking to the building where my office resides is almost always an exercise in seeing. All walks should be. Still...life. July 20, 2015: A found still life of colors, nuances, shapes, forms and simplicity in clutter. Amidst all else, there is visual poetry. Still...life. July 19, 2015: Weeds. Until light and shadow revealed them as things of beauty. Still...life. July 18, 2015: My place of calmness and sanity. Find a place for you; everyone needs them. Still...life. July 17, 2015: In tough conditions, sometimes it is the weed that survives and stands tall. Sometimes we need to be more like weeds. Still...life. July 16, 2015: Red, blue and green: the primary colors. Sometimes the right mix provides a wonderful, relaxing feeling if you find them put together just so. Still...life. July 15, 2015: As a kid, it felt like there was magic in the red dirt on the side of grandmom's car when she returned from visiting relatives in Mississippi and friends in the country. Now, I know there is. The magic is what draws your heart, soul and energy into the dirt, and the magic is what grows out of it: heart, soul and energy. Still...life. July 14, 2015: Stay away from boxes or pigeon holes...the kind that others put you into. Bosses, partners, friends and even strangers can. They place you there for their safety, not yours. Still...life. July 13, 2015: Little light, little energy...time to put one's feet up and relax. Still...life. July 12, 2015: The tranquility and serenity belie the labor required. Things are rarely as they seem; something to consider when comparing ourselves to others. Still...life. July 11, 2015: About 35-40 years ago, I photographed a dandelion pod and always enjoyed looking at it. This image reminded me of then...in many ways. Visual memories have a way of carrying much with them. Still...life. July 10, 2015: I sat down for a breather about 10 pm, thinking I would take my Still...Life image momentarily. Next thing I knew...it was no longer 7/10. I missed my deadline, but appreciated the exhaustion of a day fully lived. Still...life. July 9, 2015: Colors, calming...seeking the cool and calm during a hot Houston summer. Cool ponds, cool drinks, cool water, cool light. Still...life. July 8, 2015: Blinding. The bright light almost hides the plant and its points as effectively as darkness does. Blindness comes in day and night versions. Still...life. July 7, 2015: Leaf and stone; alive and dead; dynamic and static; yin and yang. Still...life. July 6, 2015: This abandoned school, once a symbol of education, learning and young lives is now not much more than a ruin. If the walls could speak... I hope its alumni have fared better than it. Still...life. July 5, 2016: Finding, creating or getting help to create a more clear path is almost always a good thing. It works for roads, too. Still...life. July 4, 2015: The sacrifices of many--citizens and soldiers, prominent and obscure--to keep this grand experiment of liberty and freedom working. Still...life. July 3, 2015: We, just as the star, must take it upon ourselves to stand on our own two feet. Still...life. July 2, 2015: Leading to Independence Day, another flag and another reminder of the price and value of freedom and liberty. Never take any of it for granted. Still...life. July 1, 2015: A new flag at my place away from places. Each visit a reminder of life, liberty and pursuit of happiness, as well as of private property. I feel a lot of flag inspiration leading to Independence Day. Still...life. June 30, 2015: I tell people that you can learn a lot about person by looking at their bookshelves. I took a moment to look at mine tonight. And I smiled. My soul revealed on the spines of books. Still...life. June 29, 2015: It seems that we often are so focused on the door knob, working it and trying to get in, that we don't notice that the door is already open. Still...life. June 28, 2015: "Put me in coach / I'm ready to play today." Spent the day with a friend, my eldest son, his wife and his first born daughter...more than a quarter century ago, he and I attended games, he being an Astrosbuddy. Officially, it was "Family Day" at the park, a perfect time for us to be together. Still...life. June 27, 2015: "As comfortable as an old pair of shoes." Find a pace and place for that. Still...life. June 26, 2015: I thought I was photographing lines and patterns again; I am drawn to that often and always have been. Then I realized I was photographing a bird. Always look more thoroughly. Still...life. June 25, 2017: I wonder if the designer of this simple chair realized how beautiful its curves would be in this type of light. We never know the full beauty of what we create because we cannot see it like others do. Still...life. June 24, 2015: Light, shadow, color and lines...simple pleasures seen well. Still...life. June 23, 2015: Working hard at a tradeshow and conference couldn't distract me from enjoying the view of lines, colors, angles. No matter the task, include time for seeing. Still...life. June 22, 2015: Whenever inside looking out (or outside looking in) the view is always different if just looking at what is in front of us. Still...life. June 21, 2015: Out of town for Fathers Day for the first time ever, but this moment of men and boys, kids and their heroes at a AA baseball game served as yet another reminder of the joys of fatherhood. Best job ever. Still...life. June 20, 2015: It doesn't matter how neat and orderly the hotel room is and how tidy they make the bed...it is not home. No matter where I go or why, I look forward to being home. Still...life. June 19, 2015: Though I don't do it often, I enjoy polishing my boots. The actions, sounds and finished product bring back memories of helping dad by holding down his shoes while he polished them before church. Still...life. June 19, 2015: Time for another sanding and coat of paint for this smoker that my sons gave me years ago. Well-worn and much enjoyed. Discarding is not an option. Too many things that are enjoyed and give joy are discarded. Still...life. June 17, 2015: A colorful day of resting and seagulls flying over calm waters. Indoors that is. Outside, rain. It helps to appreciate both. Still...life. June 16, 2015: One of my students in the Czech Republic said a few years ago, "I forgot how important the mood of melancholy is." It is...in its beauty and power. Still...life. June 15, 2015: From the darkness of fond memories comes the image of The Duke, a symbol and character that seems to be missing. Remembering is a good thing. Still...life. June 14, 2015: Smoking some pork on the grill before another week of rain begins. The pace and the taste of smoking reminds me that life, too, is sometimes tastier when enjoyed slowly. Still...life. June 13, 2015: An old favorite lure and my dad's 50+ year old reel. Memories sit on my shelf and in my heart. Still...life. June 12, 2015: Are these the pieces to my puzzle that I have been missing? Our missing pieces can be found if we are aware of them around us. Still...life. June 11, 2015: Reflections--one of the themes for my upcoming photo group meeting. Reflections--a found subject within a subject. Seek and ye shall find. Don't seek and you may still find. Still...life. June 10, 2015: Corrugated architecture, or architectural corrugated. Things become other things with the magic of light and shadow. Still...life. June 9, 2015: He has had his day in the sun, and now has been set to pasture...the reception area of my office. We should have a place to go after our days in the sun. Still...life. June 8, 2015: The sunlight penetrated the fig leaf, pulling it out of the shadows. Come out of the shadows with the clarity of light. Still...life. June 7, 2015: Lines, forms, light and shadow. The nuances added by designers, but never fully appreciated. A lot of creativity ends up that way. Still...life. June 6, 2015: The welcome mat welcomes, while also partially hiding the flaw of the broken tile and protects from possible missteps on the drop off. A genuine welcome. Still...life. June 5, 2015: My son and I dug out the tractor that had been stuck for a month. Hard work, basic tools and diligence can remove things from which they are stuck...tractors, lives or anything in between. June 4, 2015: Simplicity of lines and of clouds drifting on a blue sky. Simplify, simplify...even when simply seeing. Still...life. June 3, 2015: Light and shadow; pen and paper. Yin and yang; peas and carrots. Still...life. June 2, 2015: Besides being much more effective than its nylon-bristle counterparts, this broom provides me...sound. The aural affirmation that I am making progress with cleaning. Use things that engage as many senses as possible. Still...life. June 1, 2015: The blooms are now lemons and they are the first thing I see when I leave the house. Watching them survive recent storms as nubbins and then grow. I like watching plants (and people) grow to become what they are made to be. Still...life. May 31, 2015: Clothes hangers come in so many varieties. This throwback version provided another trip down memory lane of days when this message meant something at the mom-and-pop shops that made great communities. Still...life. May 30, 2015: Modern gas with ethanol rotted out the fuel line of the string trimmer despite "preservative" being added. Back to the old school ways of edging, bringing up great memories of the days when this tool was common. It became a tool of time travel today. Still...life. May 29, 2015: In its shape, color, form and purpose, it stands out from the busy-ness behind it. It has to...its part of its job. Jobs sometimes require us do things that don't seem natural to us. Still...life. May 28, 2015: Amidst the grasses, this weed stands tall...different in its purpose and its beauty. An important lesson for all. Still...life. May 27, 2015: I feel a bit like Noah, seeing sunshine again. More rain is coming, but the brilliant light of the sun provided an invigorating respite. There are always times that allow for storm recovery. Still...life. May 26, 2015: Someone asked me a few months ago if I had a favorite of my own photos. Another person replied for me, "The next one he takes." Every day, another option of a photo to create. Still...life. May 25, 2015: Memorial Day. A day to honor the pain, sadness, courage, valor and sacrifice of military service. Long may she wave in your honor. Still...life. May 24, 2015: All smiles. The frames have begun to arrive for my upcoming photo exhibit at Freeman Library. It is good to smile. It is good to have things that make you smile. It is good to be open to smiling. Still...life. May 23, 2015: Ironic that I can no longer drive onto my property due to rain damage to road and culvert, yet these footprints remind me that those native to the land continue to move about freely. Most any location or environment provides a similar reality check. Still...life. May 22, 2015: You know that you've had a lot of rain when a water bird shows up in the neighbor's driveway, looking around as if to say, "Wasn't there a lake here yesterday?" Things change; humor remains. Still...life. May 21, 2015: It occurs to me as I look at this set of well-used keys, that we spend much of our lives looking for keys to unlock success, happiness, wealth, health, etc. The keys to life don't come on a ring. Still....life. May 20, 2015: When life seems to be moving at a frenetic pace with uncertainty at every corner...pause, find simple beauty in shapes, lines, tones and flaws. Life comprises those things. Still...life. May 19, 2015: What's left of dinner could be a midnight snack or breakfast. Something about eating cold pizza makes me feel like a kid. I should eat it more often. Still...life. May 18, 2015: I had to reverse the image to make the lettering readable. Sometimes we have to change how we see things to make them understandable. Still...life. May 17, 2015: Day passing too fast. This project requires a photo. Go! See! Create! The textures and forms of young cucumber leaves lit by a low-wattage outdoor light fits the bill. Take action to see, to create. Still...life. May 16, 2015: Waiting for the start of the gathering service for family and friends of Roger Eichhorn, a man of engineering, wood work, nature, photography, cooking... Here the blend of man-made lines and nature's curves, all in all creating rhythm. Still...life. May 15, 2015: Smart guy, that Francis. Once we find what is our own to do, we must commit to it with every fiber of our being. Still...life. May 14, 2015: The walkway just outside my window provides a clear path. I still look for my clear path, so my guide stays close at hand. Still...life. May 13, 2015: 40 years ago I wrote of Schlitz beer, "Now that you have made Milwaukee famous / is it too much to ask / to make me feel good?" Another cheap friend is asked a similar question decades later. Still...life. May 12, 2015: As kids we would look at things and imagine all sorts of characters or scenes. This became a hundred things in a single glimpse. It's good to be a kid. Still...life. May 11, 2015: Proud to be a Rotarian...in service. Still...life. May 10, 2015: Birthday day today. It started out with an unexpected gift of simple color, and got better as the day went on. Simple gifts just by noticing. Still...life. May 9, 2015: At times it seems that stopping is an impossibility; at other times stopping seems too final. Still...life. May 8, 2015: I missed it. I didn't have the chance to create images--well, I did but lost track of time and opportunity--until 15 minutes after midnight for the 8th. Even if you miss your deadlines for enjoyment, do it anyway. Still...life. May 7 2015: This little statue was a gift from a woman who had it to commemorate the future she and her husband hoped for with her dad teaching their son to fish. The grandfather died before such lessons could begin. Years later, she gave it to me because of my love of fishing with my sons. I will remember this when I fish with my grandgirls. Still...life. May 6, 2015: The journey of pursuing a calling and not just a job has had a few twists and turns, but it has finally brought me to where I can serve others, empower them, honor their gifts, and live my faith and values. Still...life. May 5, 2015: Here's to you, Roger. He was my first boss in higher ed and refinished this old wash table that has been in my family for 100 years. He taught me about leadership and that it is okay to care for those on your team. He is now gone. Miss you, Roger. Still...life. May 4, 2015: The unseen labyrinth of mole or gopher tunnels, combined with a wet month created an unseen trap. The tractor found it. Watching for the unseen can be one of life's great challenges. Still...life. May 3, 2015: From the ground or in the sky, or anywhere in between---beauty. Bringing them together for just a moment...life is in the moments. Still...life. May 2, 2015: Weathered, worn, tattered...an interesting beauty in the patterns developed over time. Still...life. May 1, 2015: Find the light. Always...find the light. Still...life. April 30, 2015: I wonder...would all the ships launch if Helen walked by? Sophomore literature class stuck with me. Literature should. Still...life. April 29, 2015: Stop and smell the....anything. Just stop. Notice. Colors, light, shadows, patterns, movement, stillness...be still and notice. Still...life. April 28, 2015: Seeing colors, hearing the sound of the whipping in the wind, feel the air's movement, smell the salt air...all senses to take in a moment. Still...life. April 27, 2015: I throw vegetables and other organics in my front garden, likely to the chagrin of the HOA. Today, I noticed this surprise...tomato plants...."volunteers" is the term for plants that come up on their own accord like this. We need more volunteers. Still...life. April 26, 2015: April showers brings... The richness of colors, and the juxtaposition of the decaying fence with the blooming flowers.... Still...life. April 25, 2015: Stormy winds blow, and each is responding differently. Still...life. April 24, 2015: I am thankful that they were curious to see what was on the other side of the fence. Their curiosity and growth provided me a view otherwise unseen. Imagine how that works. Still...life. April 23, 2015: Oven baked chicken. Nothin' fancy, but neither am I. Consonance in all ways is a good thing. Still...life. April 22 2015: Amidst light and dark are subtle colors...as it is with most things we think are black or white. Still...life. April 21, 2015: This could be the signature of the grasses. I've seen less legible that come from hands. We all leave a signature whether we know it or not. Still...life. April 20, 2015: This small potato "harvest" doesn't make me ready to set up a booth at the local Farmers' Market, but it is rewarding to be able to produce. Much is learned by living in Nature's time, not Society's. Still...life. April 19, 2015: Ben Franklin flew a kite in such storms, with no idea how lights, power lines and such would come about from his experiment. Experiment. still...life. April 18, 2015: Natural beauty and constructed beauty; power and grace..all revealed post-storm in the late day light. A lot becomes more clear and seen differently after a storm. Still...life. April 17, 2015: Lightning never ceases to amaze me. It is good to be amazed by things and hold things in awe. Still...life. April 16, 2015: Different types of grace and elegance in lines, colors, and forms, and both worthy of notice. Still...life. April 15, 2015: Somehow darkness provides a wonderful view of the relationship between light and dark. Yin and yang. Such is life. Still...life. April 14, 2015: You can be half way there everyday, getting closer, closer, closer...and never arrive. Don't be satisfied with half way there...finish the race, the trek, the journey...even if you are crawling across the finish. Still...life. April 13, 2015: Green. Spring green. Make-the-crayon-jealous green. Call it what you will, but it is a beautiful reminder of life anew. Still...life. April 12, 2015: Night's quiet, mystery and aloneness provides a great time to pause, reflect, think. Just take the moment. Still...life. April 11, 2015: 100% chance of rain today has so far only produced clouds. Life is that way. Mom used to say "don't worry about things that likely won't happen." Wise mom. Still...life. April 10, 2015: Computers are fine, but sometimes inspiration needs a place and a view for writing with pen or pencil and paper...a writing table to write. Much to express. Still...life. April 9, 2015: Almost every morning, I walk by this bench. It whispers, "I am waiting for you." I walk by. Opportunity lost. We are whispered to every day. Still...life. April 8, 2015: A friend gave me the t-shirt with this message on it. I think I'll write a short story about a bar fight that breaks out when a photographer wears this into a joint full of artists of all ilk. Or write your own Hemingway-esque story. Still...life. April 7, 2015: There is something welcoming, private, moody and serene about parking lots at night...a place to pause, to feel, to think. The day's activities overtaken by darkness and shadows. Still. Still....life. 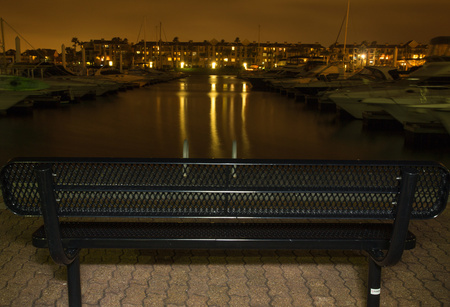 April 6, 2015: Forrest Gump has his bench; I have mine. This is located outside my new office for Empowered Creativity Institute...a view, mood and setting for creativity indeed. Much to do, much to do. Still...life. April 5, 2015: Flying in formation or in their own way, they'll get there together. You shouldn't expect others be always be "in line." Enjoy the flight and the journey. Still...life. April 4, 2015: Mother and daughter holding hands before a fun run; the community holding hands to raise money for a food bank. Holding hands makes the world better. Still...life. April 3, 2015: No idea where it started or where it will end. Such is life. Still...life. April 2, 2015: Stop on whatever path, road or trail upon which you are travelling...to see. Still...life. April 1, 2015: Not everything or everyone that is beautiful has a sign to remind us to stop, look and appreciate. That is up to us. Still...life. March 31, 2015: As a kid, I loved splashing in puddles and in the "gutter" (which is what we called the place where water collected along the curb). As a much-older-than-kid, I still like to make a splash. Still...life. March 30, 2015: Whether bloom or bud or leaf...never stop reaching for the sun and sky. Good advice, Rose. Thanks. Still...life. March 29, 2015: A place to pause, a place to fish, a beautiful morning to be out, to see, to breathe. Still...life. March 28, 2015: Simple. Good to see. Good...to see. Good to....see. Still...life. March 27, 2015: Spending time almost every morning now for a walk with my camera as companion has a way of clearing my mind. Opening myself to discovery. I find interesting things...and I often find me. Still...life. March 26, 2015: Two birds. Still...life. March 25, 2015: Light dwindles leaving cloud-made paint strokes on the blue canvas of the sky. Art and beauty everywhere, and not all of people's making. Still...life. March 24, 2015: Blooms and buds, blue skies and bees. Spring changes the view every day. Still...life. March 23, 2015: Spring has sprung...today it felt like it exploded. Beautiful light, stunning colors, bold reminders of spring energy and renewal. Easter must be right around the corner. Every day for growth and renewal of one type or another. Still...life. March 22, 2015: I remember when I bought my first "real" camera--a Pentax SP500--and became immediately enamored with the look of the front of a camera's lens: reflections, colors, the artificial eye that let's me see what my mind imagines. I frequently look at a lens and remember those early days. I don't think that I have ever taken it for granted. Still...life. March 21, 2015: In this calm before the (another) storm, I see that hope springs eternal. The tree hopes for strong blossoms; the bees (what few are left) hopes for tastiness inside the blossoms; and, I hope for juicy lemons from the blossoms-turned-to-fruit thanks to the bees. There is always so much to look forward to while enjoying the moment we're in. Still...life. March 20, 2015: The light caught my eye and the bottles caught my imagination. I bet they would be great to hold moonshine...if I had a still. Still....life. March 19, 2015: Sometimes seeing with curiosity is fun and an exercise in "what if?" A life of seeing "what if?" Still...life. March 18, 2015: It has been a wonderful Spring-like day, inspiring me to render the browns of winter giving way to the early greens of Spring pushing through. The camera option to enhance the colors for what I wanted was titled "Retro." I saw them as the color balances I grew up with in early photography. Retro...my youth. Still...life. March 17, 2015: Sitting in the car wash as the machine drops its cleansers on the car...and art appears...beauty is revealed. Every moment to which attention is paid reveals beauty of some sort or another. Still...life. March 16, 2015: She made my day. It is that simple, but it also reminds how powerful a force that of sincere observation and compliment truly is. As my dad used to say about compliments: "It makes their day and costs me nothing. Why not?" Indeed. Every day is a chance to make a difference with our kind words. Still...life. March 15, 2015: Spring is coming. Green is encountering stubborn browns. All is right, but all is upside down. And that is fine. Such is life. Still...life. March 14, 2015: Like a moth to light, I am always drawn to my home. Always have been. No matter what takes me out, I am always called back. Still...life. March 13, 2015: Lemon blossoms greet me as I come up the walk at the end of a long day. They catch my eye in the darkness differently than during the day. The low glow of a porch light draws out the blooms from the dark yard behind. Pause. Notice. Sniff. Create. Still....life. March 12, 2015: Rain continues, providing wonderful colors, sheen and light. Always so much to see. Still...life. March 11, 2015: James Taylor sang, "Damn, this traffic jam. Oh, how I hate to be late. It hurts my motor to go so slow. Damn...this traffic...jam." Nietzsche said, "That which does not kill us makes us stronger." Living in Houston is cause to reconcile the two quotes. Still...life. March 10, 2015: This section of the program from Dave Ramsey's EntreLeadership program touched me. I've never worked for an organization with a leader like this, but I believe in the concepts. I tried to lead this way, but was not able to at all times. But these set the bar and in this new career I can help others grow their teams because people matter. I can share to help others live more fulfilled lives. So much to do in Life, Phase III. Still....life. March 9, 2015: When I first got a good SLR camera in high school, I would look to the ceiling to see...to focus...to compose. I wanted to see more than I had the money to finance film for. I continue to look at ceilings to see what new there is to see. Still...life. March 8, 2015: Signs of a weekend's labors with pick axe, shovel, chainsaw and more. The only thing that isn't sore is my bald spot. Feeling...a sign of life. Still....life. March 7, 2015: My Walden. So many plans while this muscles and energy still have some oomph. ...worth every minute of living out the dreams. Still...life. March 6, 2015: Checking in at the desk of Turner High School, prior to presenting to the seniors a topic inspired by Walt Whitman's poetry...I see this quote by Maya...."People will remember how you make them feel." I hope the students felt empowered to live their lives authentically. Still...life. March 5, 2015: I had to resort to a photo created with my phone while driving to a photo group for which I review images. There, on the tollway, my hat caught my attention...a bit used, a bit worse for wear, but a whole lot of comfortable. Not just my hat, but me too. Still...life. March 4, 2015: Years ago, a friend gave me this cup. It was popular after the release of the movie Dead Poet Society. Seeing it this afternoon, worn and stained on a rough-surfaced table, the poignancy of the meaning became more profound. Still...life. March 3, 2015: Amidst the fog, the signs of seasons. The oak held on throughout the winter. Another awaits its leaves for spring and the other has started with optimistic growth. Different trees and different states at the same time. Sort of like people. Still...life. March 2, 2015: One of the benefits of not ever being in contention for "Yard of the Month" is that I get to see some beautiful arrangements. They strike me as more realistic and natural. Besides I have more in life to do then to pamper St. Augustine. Still...life. March 1, 2015: Not a day goes by that I don't thank the Lord for Mom and Dad. Not...a...single...day. They have been gone so very long. Still...life. February 28, 2015: Finished the month atop a tractor. Never made it to the hammock, but peace and relaxation came in different ways. So much to do, and to look forward to. Still...life. February 27, 2015: My place away from places always reveals to me many faces. The expressions of nature never disappoint. Still...life. February 26, 2015: The project requires that I stop the busyness long enough to complete the day's goal of a photo. That requires me to think beyond my normal inspirations. That requires me to see anew. Perfect. Still...life. February 25, 2015: I took my own headshot for publicity...where did this man come from? Looking at the image--gray hair, 80 pounds more than senior year in high school (see 2/20 post). The mirror that is the image reveals many changes...brought about by a blessed life. Still...life. February 24, 2015: "Stars" suspended by poles; "stars" glued to roads...all come out at night. Long days reveal the beauty, mystery and otherwise unseen that appear only at night. Still...life. February 23, 2015: It looks rundown and decrepit, but is surely a treasure trove of stories. People are that way, too. The bright hydrant calls for attention in front of a building that no one pays attention to anymore. People are that way, too. Pay attention. Still...life. February 22, 2015: Not straight and beautiful like the pine; not majestic and beautiful like the oak. Gnarled. Beautiful. Perfectly imperfect; imperfectly perfect. Such is all Creation. Still...life. February 21, 2015: I was accepted into Rotary International a few weeks ago. ...a lapel pin that I am proud of and want to wear because of their commitment to service. Still...life. February 20, 2015: Spoke to some students about writing. It was nice to be back at a place where I grew, where mom and dad sacrificed to enable me to attend. All of it was about growth. The message remains today. Still...life. February 19, 2015: In my current years, I see age and experiences in this gnarled opening; as a child I saw the home of fairies and other magical friends. Even when looking through trifocals, we can sometimes look through younger eyes and have mystery and imagination re-stirred. Still...life. February 18, 2015: This belief drove me as an employee and as a manager. It drove me to make the job changes to self-employment so I could live the concepts more fully and genuinely. This is leadership, management, empowerment and living. (Romans 12) Still...life. February 17, 2015: Posing stool. It is not something that I ever used before, but great things can happen there when used properly. People revealed for who they are, if even only for a few moments, on this round space. So many more to see and reveal. Still...life. February 16, 2015: I'm not sure whether it is the beauty of the shape, form, tonalities and symmetry that inspired me, or my envy of the same. I will need to search further than the refrigerator. Still...life. February 15, 2015: Of all the classes I took in college, the most valuable was first semester...typing. Worn keys--their sheen and smoothness under my fingertips--remind me like the scent of ink...the clacking of keys like the sound of pen nib on paper...of my love of words and the ability to call them up. Many more await. Still...life. February 14, 2015: She always stirs me. Let yourself be stirred. Still...life. February 13, 2015: I received my 25 pounds of gum today. I think I buy so much because in each piece is memories of getting a piece after getting a crew cut from the barber with the polio-crooked neck, blowing bubbles while riding bikes, chewing in little league games, teaching my sons to blow bubbles. More gum, more memories. Still...life. February 12, 2015: Swings bring back childhood memories, teen memories and fatherhood memories. These, lonely and unused at night, still call out for companionship and remind me of great times. More to come. Still....life. February 11, 2015: They remind me of skills I am just learning but my mom, aunt, grandmother et al were great at. The sunshine and warm temperatures remind me of spring...and hopefully enough garden goodness to put up. If that doesn't work, there is always chili, beans and fish! There is always, always...something. Still...life. February 10, 2015: Ceviche: raw fish "cooked" in the acid of lemon juice, onions, avocado, jalapeno and tomato. Youngest son catches the fish and makes the tasty mix, proud of his success and treat. Each day is a chance for treats...and color and spiciness. Still...life. February 9, 2015: Shortly after midnight, and the day started with mystery. Every day should have some mystery and stirrings of the imagination. Still....life. February 8, 2015: Leaves hang on as winter nears the end and spring looms on the horizon. Lesson learned: never surrender...even if you end up losing most of those who were around you. Be true. Still...life. February 7, 2015: The greeting to all who entered the fun of Emmie's first birthday party, along with hugs and kisses, and a reflection. The first birthday of granddaughter number three was all that. And more. Still...life. February 6, 2015: Some things simply ask you to pause, sigh and thank God for beauty. This was on of those things. It surrounds us every day. Still...life. February 5, 2015: Good evening guys. They stand tall throughout the year, providing me a welcome in the morning or a greeting when I return home. Season after season, they remain. Growing. Changing. They whisper the same about me as the wind blows through them. Still...life. February 4, 2015: Is the arrow a sign of direction for the footprints, or are the footprints a sign of faith and courage to take a direction to the unknown? Still...life. February 3, 2015: If grapes were made of light. Another day of rain and the vineyard forms on my windshield. New views every day. Still...life. February 2, 2015: Working a lot of 14-16 hour days and exhilarated by every minute of it. Instant coffee is a good friend as I build my business, explore my own creativity while empowering others, believing every day is an opportunity for growth. Still...life. February 1, 2015: These letters reside on the wall of the Houston Center For Photography, one of the places that I teach. It is a place of magic for all who enter, whether they come to teach, learn or look. Find your places of magic and go there often. Still...life. 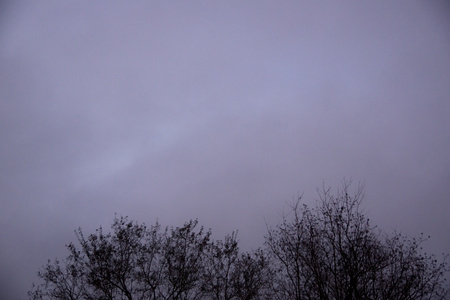 January 31, 2015: The last remnant of blue as the gray rolls in. The trees bearing signs of winter, but waiting for spring to roll in, too. And so it goes in cycles. Still...life. January 30, 2015: Sometimes life appears to be moving faster than it is. Sometimes exhaustion makes it so. Sometimes being excited about what you're doing makes it so. Be exhausted by your excitement. Still...life. January 29, 2015: I created a video today to help people in their job HUNTing, using the hunting metaphor to provide guidance. Job hunting can be a discretionary adventure or a matter of sustenance. But work defines us, as does the search for it in many ways. Still...life. January 28, 2015: Never. Still...life. January 27, 2015: Each day a fresh page; each page a siren's call to come hither. 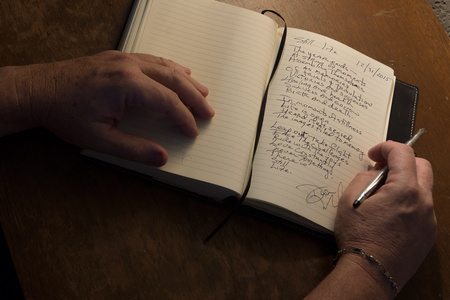 Nothing can move the pen other than the one writing about the day that started as a blank page. Still...life. January 26, 2015: Years ago, I would lay out my fishing lures to admire, organize and conduct some maintenance. Now, my youngest son, a sponsored fisherman, lays out his lures as the man's tools of the trade that they are instead of as boyhood toys that they were. Still...life. January 25, 2015: The end of the long day and one of the last things that I see is the one who can't see me. She is largely blind but as sweet as they come. Old enough to have bladder issues but young enough to always wag her tail hello. A simple pleasure. Still...life. January 24, 2015: Who is in whose domain? I would say this applies whenever two paths cross. Always walk carefully. Still...life. January 23, 2015: Colors and textures, a refreshing change from the mass of paperwork that has consumed the morning. Speaking of consuming...."Time for breakfast, Lacey (dog)." Still...life. January 22, 2015: Cold (by Houston terms) and wet (by anyone's terms), so you have to find color and "sunshine" on your own terms. Such is life. Still...life. January 21, 2015: There are times that you can look at something and immediately think, "I know how that feels; I've felt like that." This was one of those times. Still...life. January 20, 2015: The world is full of interesting lines, patterns, forms, juxtapositions and perspectives. A different take on a school football stadium. Still...life. January 19, 2015: The words are from Walt Whitman's "Song of Joys"; the plate from my sons on the occasion of my departure from a 27-year career in higher education. A daily reminder of much. The adventure continues. Still...life. January 18, 2015: A place of much labor, hard lessons and exhaustion; and a place of rest. Still...life. January 17, 2015: Lines and light, an observation of lines and rhythm. Somehow this seems peaceful and still. Calming. Still...life. January 16, 2015: The flag greets me every time I leave or arrive home. Today, she looks tired. But she persists, as do we all. Still...life. 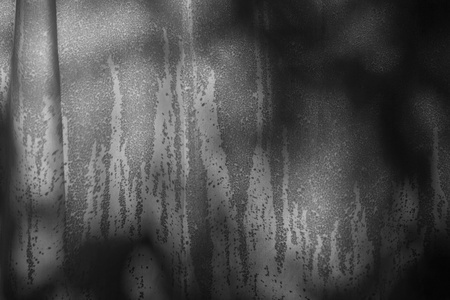 January 15, 2015: Another gray day of light rain, making surfaces that can reflect the light even more noticeable by contrast. Gentle lines, simple grace...ah, simple grace. It surrounds us if we look and see. Still...life. January 14, 2005: Nothing spectacular, except that it is...the nuanced colors, gentle curves, detailed textures. Pause to be in awe, if only for a moment, of the things around you. Still...life. January 13, 2015 A life of seeing. Front and center is how it all began, thanks to Santa, more than half a century ago. A simple reminder on the wall of something that matters. Still...life. January 12, 2015: Fishing caps and cowboy hats--heart and soul on the walls. Some things reveal to the world who and what you are at your essence. Look around. See. Those things are you; see what shows in others' homes. See. Still...life. January 11, 2015: Early morning light creeping in between thunderstorms, and already there is pattern, rhythm and balance. A good day to see. Still...life. January 10, 2015: "All the world's a stage," Shakespeare said. The theater of your world awaits your presence. Don't take the side exit; enter the stage proudly. Still...life. January 9, 2015: Album covers--a mirror to an eclectic, bit-worn self--and a time machine taking me back to the boy of then becoming the man of today. Still...life. January 8, 2015: Gold bands of union. These old pool cues helped connect me to my dad, my friends growing up, and my sons. Soon, they will do the same for granddaughters. Still...life. January 7, 2015: Stop. Pause. Look again at the textures of the lemon balm leaves hanging to dry to some day make tea or other purpose. Texture, color, beauty. Aging, changing...new purpose. Still...life. January 6, 2015: My mom's first tennis racket on top, mine below...separated by 40 years. Wash table generations old refinished by dear friend two decades ago. Connections, memories, legacies. Still...life. January 5, 2015: Bookshelf: me as baby, me with sister, handprint of youngest son (now 22) and the torch I carried in Albuquerque for 2002 Winter Olympics (thanks to essay that middle son wrote to nominate me). The message on the torch grows more important every day. Still...life. January 4, 2015: Onion, garlic, lettuce, potato...growing because of light, water, nutrients...while indoors in buckets. Growth happens anywhere, given the conditions for it. Grow anywhere. Everywhere. Still...life. January 3, 2015. A clock that has been in the family for more than century, a reel that was my dad's decades ago, and the last photo of me, my dad and my eldest when he was not quite one. Still...life. January 2, 2015. Found waiting for me in the shower...a simple reminder of routine, warm showers, and simple comforts we take for granted. I enjoy the simplicity of the colors, too. January 1, 2015 These pieces serve as a wonderful reminder that...life goes on. They reveal a wonderful view of fishing and catching, or so it seems. They also represent a lifetime of interest for me, my sons, my dad, my granddad... These ornaments were gifts, among many given to me over the years that reveal my love of photography and fishing. These pieces, being on a Christmas tree (another representation of stories and memories) serve as a wonderful reminder that...life goes on. Still...life.